Team members and management with Mayor of Clare Bill Chambers and Councillor Gerry Flynn at the Clare County Council civic reception for the Clare Oscar Traynor team. Photograph by John Kelly. 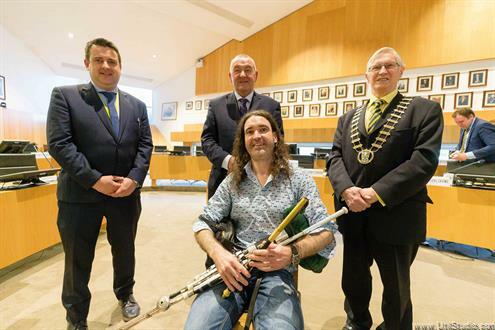 THE Clare and District side that won this year’s Oscar Traynor was granted a civic reception by Clare County Council this week, which manager Donie Garrihy said was one of the highlights of his life. The civic reception took place on Monday evening and Garrihy said he was extremely grateful to the local authority. He said he was delighted that many figures from Clare soccer were in attendance, saying he was in “super company”. He also paid tribute to the deceased father of goalkeeper Barry Ryan. The manager also paid tribute to David McCarthy, who scored four goals in the Oscar Traynor final. Donie Garrihy, team manager, speaking at the civic reception. Photograph by John Kelly. 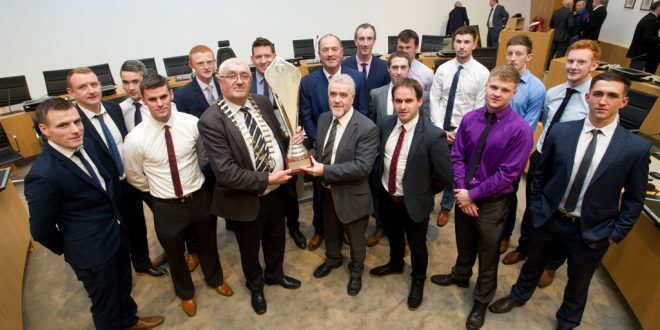 Cathaoirleach of Clare County Council Bill Chambers paid tribute to the team and said that the game is on the up in Clare. He also remembered the late Jimmy Rocks and Frank Healy. Councillor Chambers said that facilities for soccer have improved since his playing days. “We would have considered ourselves fortunate if we had some trees under which we could tog out,” he commented, contrasting that with current facilities such as Lees Road, Tulla and the county grounds. One of the councillors to propose the civic reception was Independent Gerry Flynn and he paid tribute to all involved in the success. 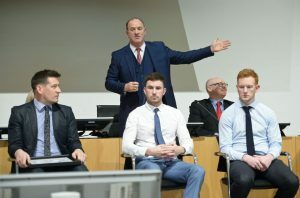 He said he had played soccer at a time when GAA members were banned from doing so, while he said he was delighted that Joe Cooney, the current chairman of Clare County GAA Board, had supported the reception. Councillor Cooney paid tribute to all involved in the successful side. He acknowledged that his own soccer career had been brief. “I did get a call-up late one Sunday morning for a soccer match but unfortunately I never got called back,” the East Clare man joked. In place of county council chief executive Pat Dowling, Ger Dollard acknowledged the team on their success. He also provoked some laughter when he spoke about the similarities between soccer and the political arena that the reception was being held in. A long-standing member of Newmarket Celtic, which supplied several members of the team, Councillor Pat McMahon said it had been a fantastic achievement. “Oscar Traynor has been dominated by teams from Cork, Dublin, Waterford and Limerick to a certain extent. For a team from Clare, traditionally a hurling county, to beat all those giants was most remarkable and the future for football in Clare has improved tremendously,” he said.